Osram made a strong operating performance in the first quarter of the current fiscal year that started in October 2014. With growth of 0.5 percent, revenue was comparably slightly above the year-earlier period , for example, excluding portfolio and currency effects. In nominal terms, the company even made a revenue increase of five percent to almost EUR 1.4 billion, resulting from the weakness of the euro against key currencies and the acquisition of Clay Paky. EBITA1 excluding special items rose 23 percent to EUR 151 million (US $171.45 million) in the first quarter, translating into a margin of 10.8 percent. This development was once again supported by positive effects from the transformation program, productivity improvements as well as the ongoing good performance of the Opto Semiconductors and Specialty Lighting segments. It was reported that Osram in contrast recorded an EBITA loss of EUR 41 million. The figure includes transformation costs of EUR 184 million, which are particularly related to the already communicated headcount adjustments in Germany. The quarterly loss after tax was EUR 39 million. In view of the development in the first quarter, Osram confirms the outlook for fiscal 2015. "The first quarter sees a successful start into the new fiscal year. But we cannot rest on the past achievement. 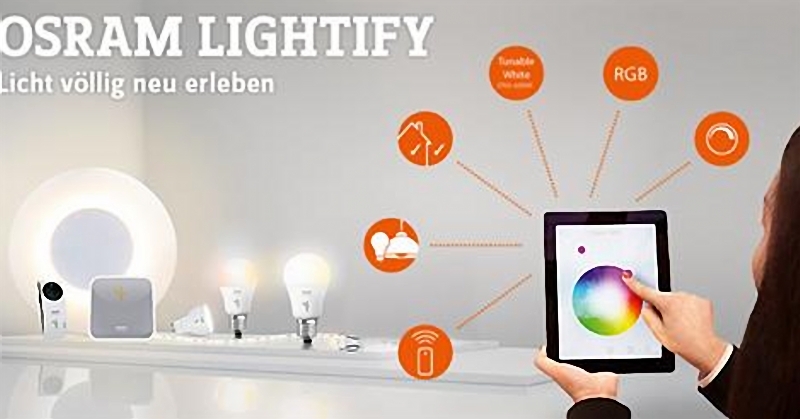 We will continue with our transformation and will announce in spring what that means in strategic terms," said Olaf Berlien, Chief Executive Officer of OSRAM Licht AG. "The quarter was also strong due to seasonal effects and was characterized by an exceptionally good operating result. At the same time, our LED-based business showed great growth again and reached 39 percent of total revenue. The traditional business performed well despite a still very challenging environment. We also made a major step forward regarding our transformation program," added Chief Financial Officer Klaus Patzak. In the first quarter, Osram opto-semiconductor components reporting segment (Opto Semiconductors, or OS) announced a comparable revenue increase of four percent from an exceptionally strong year-earlier period. The development was particularly supported by the industry business. I alll, all reporting regions contributed to the segment growth in the quarter. At 16.2 percent, the EBITA margin again reached a very good level and benefited from a favorable product mix, among other things. Specialty Lighting (SP), with its Automotive LED lights and Display/Optics units, continued to benefit from very positive demand and made revenue growth of six percent on a comparable basis in the quarter. Nominal growth was higher, at 15 percent, due to the weaker euro and the first-time consolidation of Italian entertainment lighting company Clay Paky. Excluding special items, the adjusted EBITA margin reached 16.0 percent. The reporting segment LED Lamps & Systems (LLS) covers Osram business with LED lights, light engines as well as LED driver ics. Based on the continuously growing market acceptance of LED-based products, the segment revenue rose comparably 65 percent in the first quarter. The adjusted EBITA margin improved by more than 20 percentage points year on year to minus 4.4 percent due to economies of scale, among other things. The market trend toward LEDs continued to have a negative impact on the Classic Lamps & Ballasts (CLB) reporting segment in the first quarter. Still, the comparable revenue decrease of ten percent was not as strong as in the previous quarters. The adjusted EBITA margin was 11.4 percent and benefited from cost savings. The Luminaires & Solutions (LS) reporting segment covers LED lights for professional customers, products for consumers as well as service and solutions business. The segment revenue fell 19 percent in the first quarter on a comparable basis, mainly as a result of the reorganization of the service business in North America and the regional focus strategy of the LED lights business. The segment adjusted EBITA margin was minus 7.0 percent. From a regional perspective2, Osram EMEA reporting region recorded a year-over-year comparable increase in first-quarter revenue of one percent. Revenue in the Americas region also rose one percent on that basis, while revenue in the APAC region declined two percent in comparision. Osram confirms the outlook given at the beginning of fiscal 2015. For fiscal 2015, the Managing Board thus expects revenues to be on the level of fiscal 2014 on a comparable basis. The adjusted EBITA margin is also expected to be at the prior-year level. Besides, the Managing Board expects both net income and return on capital employed (ROCE) to decrease sharply in the current fiscal year due to a sharp increase in transformation costs. Free cash flow is expected to come in with a positive triple-digit million euro amount in fiscal 2015 but to stay below the prior-year level. Based on the outlook for fiscal 2015 and Osram midterm prospects, the Managing Board hopes dividend continuity with 0.90 per share also for fiscal 2015. Osram has made further important achievements in the first quarter of fiscal 2015. The acquisition of Clay Paky was completed in October. Clay Paky is a leading provider of entertainment lighting for shows and events whose products were for example most recently used to light the traditional Nobel Prize Banquet in Stockholm. Osram also set the stage for state-of-the art lighting at the end of October, when the new lighting solution in the Sistine Chapel officially went into operation. Osram was in charge of realizing this project, which was financially supported by the European Union. The new installation consists of 7,000 LEDs and sets new standards in terms of quality of light and energy efficiency. But Osram is also leading the way regarding non-visible lighting. A few weeks before the International Consumer Electronics Show (CES) in Las Vegas, the company released its first integrated optical sensor for automatic fitness monitoring, which is used in mobile devices such as smartwatches or fitness bracelets. The sensor measures the wearer blood oxygen level and pulse without the inconvenience of a chest band. In December, Osram also presented an infrared emitter for unlocking electronic devices "with a single glance". Biometric identification methods for mobile phones and tablets are a big trend because such devices are increasingly being used for sensitive applications such as online banking and shopping. In addition to fingerprint scanning, many manufacturers are currently considering the potential of iris scanning as a new biometric method for unlocking electronic devices. With this technology, an infrared light illuminates the user eye so that a camera can take a picture of the iris and identify characteristic features.